Come and stay in our Holiday Lodges & Cottages (https://woodcombelodges.co.uk/) for the Dunster by Candlelight weekend or week. 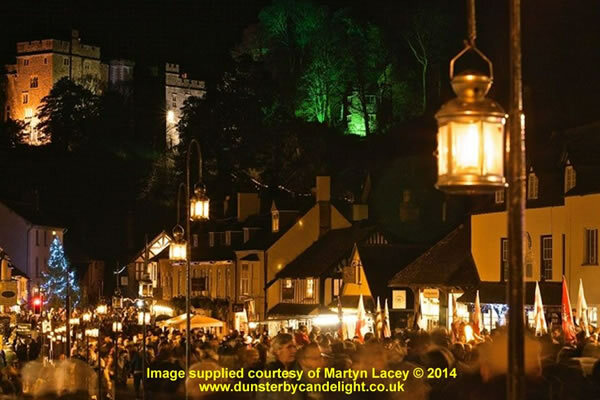 It is generally recognised that Dunster is one of the most perfectly preserved medieval villages in England. Its origins date back to the times of Bronze and Iron Age Britain. For two evenings in December the village is dressed for an old fashioned Christmas festival and calls everyone to come and enjoy the festivities. Come and join in and take the opportunity to explore the wonders of Exmoor, the least visited National Parks in England?